Mercy Memorial Hospital Chronic Care Clinic Nurse Practitioner Sue Berger and Hospital Administrator Karen Gorby consider patient files at the Chronic Care Clinic. The clinic is designed to connect patients with family physician services and assist in follow-up care for chronic conditions after a hospital discharge. Mercy Memorial Hospital Chronic Care Clinic Nurse Practitioner Sue Berger manages the clinic, which aims to help patients manage chronic conditions. She also serves as a family practice nurse if a patient does not have a family doctor. A new clinic at the local hospital is helping residents manage chronic illnesses and get family physician services as needed. 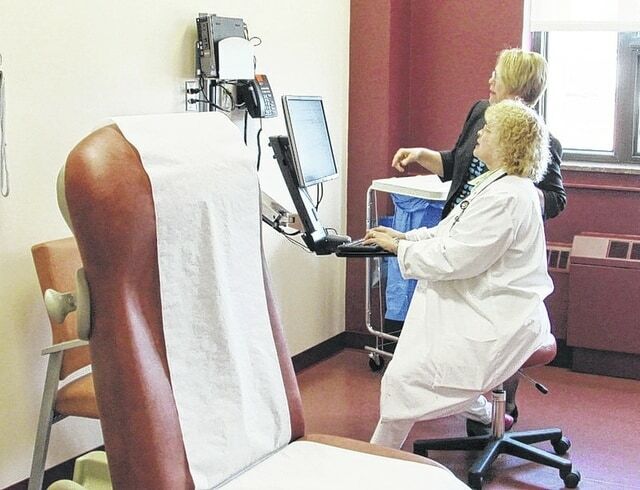 The Chronic Care Clinic at Mercy Memorial Hospital opened the last week in May. The clinic provides services to help patients manage chronic illnesses such as congestive heart failure, diabetes and Chronic Obstructive Pulmonary Disease (COPD). 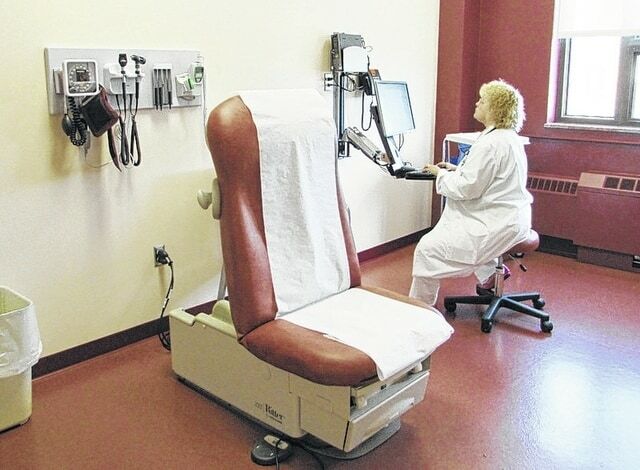 It also aims to fill in the gaps if a patient goes to the emergency room with an issue and does not have a family physician to monitor general wellness, hospital Administrator Karen Gorby said. The clinic is a needed addition, Gorby said. The hospital conducted a community needs assessment that indicated repeat emergency room visits for chronic diseases in this area. The clinic will better inform patients about their diseases and how to manage them, saving them the time and expense of going to the emergency room, Gorby said. The goal is to have patients visit the clinic within a week of being discharged from the hospital, to clarify how best to manage the disease. The hope is that this extra attention will reduce the chance of being re-admitted to the hospital or emergency room for complications. Visits to the clinic are billed to insurance. This generally is less costly than a visit to the emergency room, Gorby said. Approximately 100 to 150 patients have been seen since the clinic opened, Gorby said. Sue Berger, a certified nurse practitioner with a focus on family physician services, does office visits with clinic patients to assess their individual health needs and help them better understand them, for a better overall quality of life. Berger said she has the added benefit of being at the hospital, where she has easy access to specialists and the emergency room. She can then get a full picture of the health situation of her patient to provide better individual service. Berger became a certified nurse practitioner in August 2014. Before that, she was a nurse for 35 years. Rural areas are seeing a shortage of family physicians. Many doctors choose specializations that provide higher incomes to cover expensive medical training; or new physicians in family practice prefer to stay closer to large metropolitan areas and the hospital systems in those locations. Certified Nurse Practitioners receive advanced medical training to diagnose and prescribe for patients. Physician Assistants receive medical training at an accelerated pace. All types of providers have clinical experience, though each has a different amount of time spent receiving it. Champaign County has seen family doctors retire recently, such as Dr. Steven Polsley and Dr. Barry Paxton. Dr. Jae Koh retired a couple years ago. Family doctors who remain tend to join large medical providers in the area or bring in CNPs and PAs to assist with the workload. Family doctors will continue to be in demand as more people sign up for health care under the Patient Protection and Affordable Care Act, better known as Obamacare. Berger is not a replacement for a family doctor, Gorby said. Berger can provide the services to patients who do not have family doctors, or she can fill in for family doctors on vacation or out of the office. The goal is to supplement care for those who have it or provide it for those who do not. Gorby said though the clinic is new, the response has been positive. In the future, she would like to see expanded hours to serve more people and provide educational sessions for patients and their families in helping them understand their disease and how best to manage it. The clinic is open 8 a.m. to 5 p.m. Monday to Friday. Gorby said she would like to extend those hours later in the evening or to weekends, as demand grows. The clinic is located in the former Mercy Well Child Pediatrics space at Mercy Memorial Hospital. It provides medication management, physical therapy, dietary counseling, educational sessions and support groups for people with COPD, diabetes, congestive heart failure or mobility issues (such as obesity or arthritis). For more information, call the clinic at 937-484-6700. Physicians seeking to refer a patient should fax information to 937-484-6378.